As the year closes and we look forward towards the new year, we take a breath to reflect on our choices and if perhaps we could have made better choices. How can we live our hectic life and better manage the stress? What if we could arm our bodies and prepare our minds for living a healthy and deserving life? 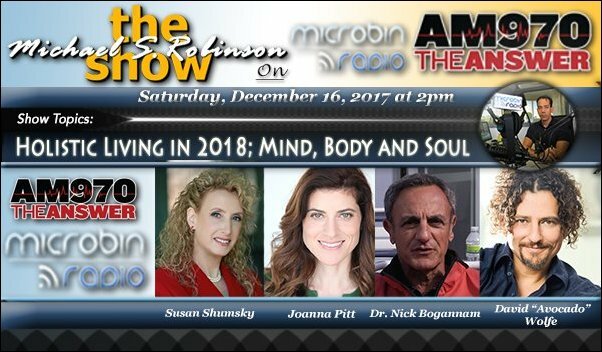 Michael Robinson about taking control of our mind, body and spirit to live a healthier lifestyle with his guests: Dr. Susan Shumsky, Joanna Pitt, Dr. Nick Bogannam, David “Avacado” Wolfe.